Prime Minister Narendra Modi,on Saturday launched the India Post Payments Bank (IPPB) in New Delhi, saying that it would help deliver banking services conveniently to people living in the remotest places across the country. 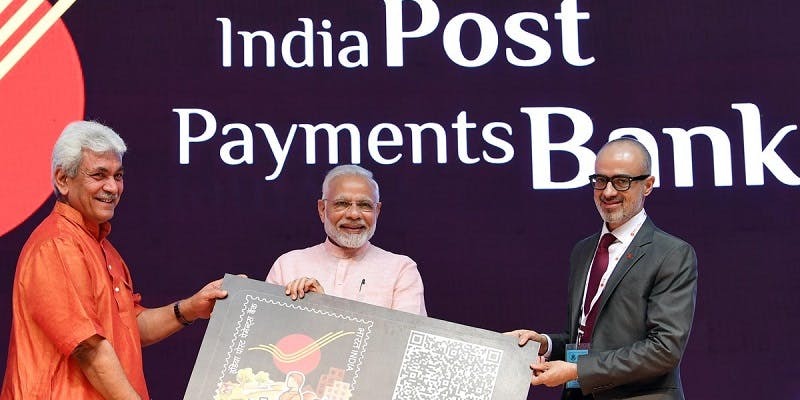 He described the India Post Payments Bank, which has branches in 650 districts, as one more step to achieving financial inclusion, following in the footsteps of the Jan Dhan Yojana. Outlining the features of the IPPB, he said it would enable money transfer, transfer of government benefits, bill payments and other services such as investment and insurance. He added that postal delivery persons would deliver these services at the doorstep of our citizens. The IPPB will also facilitate digital transactions and help deliver the benefits of schemes such as Pradhan Mantri Fasal Bima Yojana, which provide assistance to farmers. There are over 1.5 lakh post offices and over 3 lakh postal delivery personnel, or “grameen dak sevaks”, who provide the last-mile connectivity in the country. Now they shall be empowered with smartphones and digital devices to provide financial services as well. The freshly-minted payments bank will accept deposits of up to Rs. 1 lakh, offer remittance services, mobile payments/transfers/purchases and other banking services like ATM/debit cards, net banking and third-party fund transfers. Communications Minister Manoj Sinha said IPPB will be available through 650 branches and 3,250 access points. Deposits in any account that exceed Rs. 1 lakh will be automatically converted into post office savings account, he said. The government owns 100 percent in IPPB, which has been set up under the aegis of the Department of Posts, and will offer products and services through multiple channels such as counter services, micro ATMs, mobile banking app, messages and interactive voice response. It will offer 4 percent interest rate on savings accounts. IPPB has teamed up with financial services providers like PNB and Bajaj Allianz Life Insurance for third-party products like loans and insurance. The Cabinet, earlier this week, approved an 80 percent hike in spending on IPPB to Rs. 1,435 crore - arming it with additional ammo to compete in the market with existing operators like Airtel Payments Bank and Paytm Payments Bank. PM Modi also expressed confidence that IPPB shall reach over 1.5 lakh post offices across the country within the next few months. IPPB will allow three types of accounts for customers – a regular savings account, used to withdraw cash, deposit money and perform easy remittances; a basic savings account, which will allow only four cash withdrawals per month; and a digital savings bank account which will allow users to open their account through the IPPB Android mobile app. The interest rate for these accounts is set at 4 percent, while competitor Paytm Payments Bank gives approximately 6.85 percent in interest. It also allows three free withdrawals every month, after which account holders are charged Rs 20 for every transaction. As per the guidelines set by the RBI, Payments Banks cannot accept more than Rs 1 lakh in deposits and cannot provide loans. Using Aadhaar to open accounts, IPPB will use QR codes and biometrics will drive authentication, transactions, and payments. Further, Dak Sewaks are also expected to drive transactions through biometric devices and smartphones. IPPB will also provide customers with mobile banking, SMS and ATMs. Media reports also suggest that IPPB customers will be able to pay to more than 100 billing entities over time through the Bharat Bill Payments System. Media reports also suggest that the Union Cabinet has approved a spending budget of Rs 1435 crore on IPPB for it to fight against competition (Paytm Payments Bank and Airtel Payments Bank). The IPPB's website says that pilots started in Jharkhand (Ranchi) and Chhattisgarh (Raipur) in January this year.